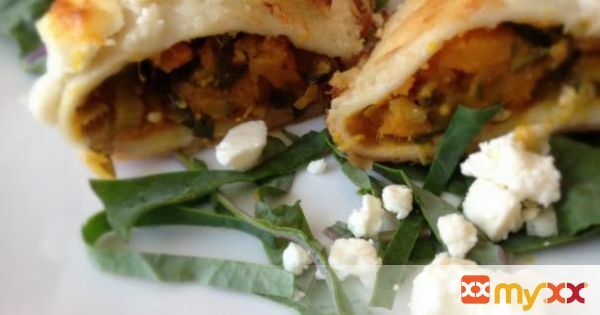 These pumpkin and kale enchiladas with a feta cheese bechamel sauce are a great addition to any Fall menu. They can be enjoyed by vegans by substituting a vegan cheese for the feta. 2 tsp. Moroccan Seasoning (Ras El Hanout) or (cumin, cinnamon, coriander, ginger, turmeric, paprika, cayenne) . Sometimes a spice blend is much easier. Garam Masala would be good too. 1. Wash, clean and cut small pie pumpkin into large chunks, you will have extra. Roast covered until soft in a 375 F oven for 75 minutes. Scoop cooked pumpkin from skins. 2. Slice and thoroughly wash leek, white portion only. Sautée in oil until soft. Save 1/2 cup of leeks for topping. Add spices, pumpkin seeds and chopped kale and cook 2 minutes more. Combine with pumpkin. 3. Spoon 1/4 cup of pumpkin mixture into each flour tortilla and roll. Place seam side down in a 9X13 baking dish. 4. Heat butter or oil in a sauce pan until melted. Add flour or corn starch and stir over low heat until combined. Add coconut milk, cook and stir until slightly thickened. Add feta and remaining leeks to sauce and pour over prepared enchiladas. 5. Bake uncovered for 30 minutes until bubbly and lightly browned.